Symphonie fantastique: Épisode de la vie d'un artiste ... en cinq parties (Fantastical Symphony: An Episode in the Life of an Artist, in Five Parts) Op. 14, is a program symphony written by the French composer Hector Berlioz in 1830. It is an important piece of the early Romantic period. The first performance was at the Paris Conservatoire on 5 December 1830. Franz Liszt made a piano transcription of the symphony in 1833 (S. 470). Leonard Bernstein described the symphony as the first musical expedition into psychedelia because of its hallucinatory and dream-like nature, and because history suggests Berlioz composed at least a portion of it under the influence of opium. According to Bernstein, "Berlioz tells it like it is. You take a trip, you wind up screaming at your own funeral." In 1831, Berlioz wrote a lesser-known sequel to the work, Lélio, for actor, orchestra and chorus. Symphonie fantastique is a piece of program music that tells the story of an artist gifted with a lively imagination who has poisoned himself with opium in the depths of despair because of hopeless, unrequited love. Berlioz provided his own preface and program notes for each movement of the work. They exist in two principal versions – one from 1845 in the first score of the work and the second from 1855. From the revised preface and notes, it can be seen how Berlioz, later in his life, downplayed the programmatic aspect of the work. After attending a performance of Shakespeare's Hamlet on 11 September 1827, Berlioz fell in love with the Irish actress Harriet Smithson who had played the role of Ophelia. He sent her numerous love letters, all of which went unanswered. When she left Paris, they had still not met. Berlioz then wrote Symphonie fantastique as a way to express his unrequited love. Harriet did not attend the premiere in 1830, but she heard the work in 1832 and realized Berlioz's genius. The two finally met and were married on 3 October 1833. However, their marriage became increasingly bitter, and they eventually separated after several years of unhappiness. Berlioz specified at least 15 1st violins, 15 2nd violins, 10 violas, 11 celli and 9 basses on the score. Each movement depicts an episode in the protagonist's life that is described by Berlioz in the program notes to the 1845 score. These program notes are quoted in each section below. Performed by the Orchestre Lamoureux under Igor Markevitch, 1962. “ The author imagines that a young musician, afflicted by the sickness of spirit which a famous writer has called the vagueness of passions (le vague des passions), sees for the first time a woman who unites all the charms of the ideal person his imagination was dreaming of, and falls desperately in love with her. By a strange anomaly, the beloved image never presents itself to the artist's mind without being associated with a musical idea, in which he recognizes a certain quality of passion, but endowed with the nobility and shyness which he credits to the object of his love. Throughout the movement there is a simplicity in the way melodies and themes are presented, which Robert Schumann likened to Beethoven's epigrams' ideas that could be extended had the composer chosen to. In part, it is because Berlioz rejected writing the more symmetrical melodies then in academic fashion, and instead looked for melodies that were "so intense in every note as to defy normal harmonization", as Schumann put it. The theme itself was taken from Berlioz's scène lyrique "Herminie", composed in 1828. 8. It begins with a mysterious introduction that creates an atmosphere of impending excitement, followed by a passage dominated by two harps; then the flowing waltz theme appears, derived from the idée fixe at first, then transforming it. More formal statements of the idée fixe twice interrupt the waltz. The movement is the only one to feature the two harps, providing the glamour and sensual richness of the ball, and may also symbolize the object of the young man's affection. Berlioz wrote extensively in his memoirs of his trials and tribulations in having this symphony performed, due to a lack of capable harpists and harps, especially in Germany. Another feature of this movement is that Berlioz added a part for solo cornet to his autograph score, although it was not included in the score published in his lifetime. The work has most often been played and recorded without the solo cornet part. However, conductors Jean Martinon, Colin Davis, Otto Klemperer, Gustavo Dudamel, John Eliot Gardiner, Charles Mackerras, Jos van Immerseel and Leonard Slatkin have employed this part for cornet in performances of the symphony. Berlioz salvaged this theme from his abandoned Messe solennelle. The idée fixe returns in the middle of the movement, played by oboe and flute. The sound of distant thunder at the end of the movement is a striking passage for four timpani. 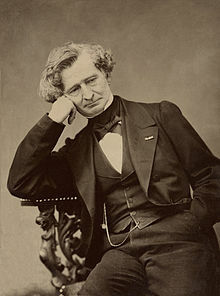 Berlioz claimed to have written the fourth movement in a single night, reconstructing music from an unfinished project, the opera Les francs-juges. The movement begins with timpani sextuplets in thirds, for which he directs: "[t]he first quaver of each half-bar is to be played with two drumsticks, and the other five with the right hand drumsticks". The movement proceeds as a march filled with blaring horns and rushing passages, and scurrying figures that later show up in the last movement. Before the musical depiction of his execution, there is a brief, nostalgic recollection of the idée fixe in a solo clarinet, as though representing the last conscious thought of the soon-to-be-executed man. The introduction is Largo, in common time, creating an ominous quality through dynamic variations and instrumental effects, particularly in the strings (tremolos, pizzicato, sforzando). 8. The return of the idée fixe as a "vulgar dance tune" is depicted by the B♭ clarinet. This is interrupted by an Allegro Assai section in cut time at bar 29. 8 and Allegro. The E♭ clarinet contributes a sharper, more shrill timbre than the B♭ clarinet. 8, this section sees the introduction of the bells and fragments of the "witches' round dance". The "Dies irae" begins at bar 127, the motif derived from the 13th-century Latin sequence. It is initially stated in unison between the unusual combination of four bassoons and two ophicleides. At bar 222, the "witches' round dance" motif is repeatedly stated in the strings, to be interrupted by three syncopated notes in the brass. This leads into the Ronde du Sabbat (Sabbath Round) at bar 241, where the motif is finally expressed in full. The Dies irae et Ronde du Sabbat Ensemble section is at bar 414. There are a host of effects, including eerie col legno in the strings suggesting dancing skeletons– the bubbling of the witches' cauldron to the blasts of wind. The climactic finale combines the somber Dies Irae melody with the wild fugue of the Ronde du Sabbat. ^ Howard, Leslie (1991). "History of Liszt's Transcription of Symphonie fantastique". Hyperion Records. ^ a b "Leonard Bernstein – Young People's Concerts". leonardbernstein.com. Archived from the original on 2014-12-05. Retrieved 2014-11-30. ^ Bernstein, Leonard (2006). Young People's Concerts. Cleckheaton, West Yorkshire: Amadeus Press. ISBN 978-1-5746-7102-5. ^ "Hector Berlioz: Mémoires – Chapitre 51". hberlioz.com. Retrieved 2014-11-30. ^ a b c d Steinberg, Michael. "The Symphony: A Listener's Guide". pp. 61–66. Oxford University Press, 1995. ^ "Hector Berlioz – Discussion on Symphonie fantastique". ugcs.caltech.edu. Archived from the original on 2015-11-26. Holoman, D. Kern, Berlioz (Cambridge, Mass. : Harvard University press, 1989). ISBN 0-674-06778-9. Oxford Companion to Music, Oxford University Press, 2002. ISBN 0-19-866212-2. Wright, Craig, "The Essential Listening to Music" (Schirmer, Cengage Learning 2013). ISBN 978-1-111-34202-9. Symphonie fantastique on the Hector Berlioz Website, with links to Scorch full score and program note written by the composer. Wikimedia Commons has media related to Symphonie fantastique.